Road side view on the way to Sandwich. Sandwich was a port town, located in between Deal and Ramsgate in Kent. Despite being two miles from the coast, the River Stour was navigable enough for large sailing ships to travel up to the harbour. In medieval times it was one of the Cinque ports, along with Romney, Dover, Hythe and Hastings. Unusually, the artist, etcher and publisher is a woman. 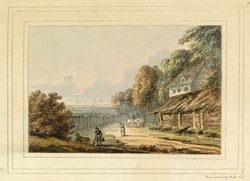 Mrs Amelia Noel (1759-1818) was a drawing mistress who exhibited landscapes between 1795 and 1804. Kent was one of her favoured locations to draw, alongside the Lake District and Ireland.